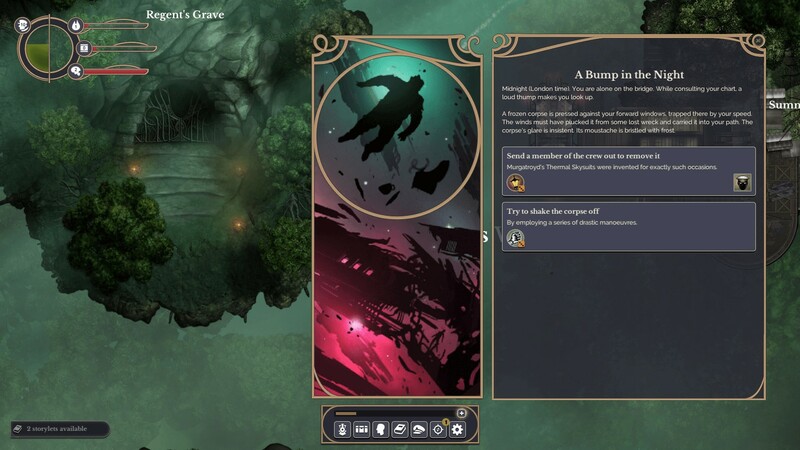 Every so often, I find myself wishing our world had progressed like the one in Sunless Skies (successor to 2015’s Sunless Sea). The prospect of commandeering a “spacefaring locomotive”, only limited by courage – and a few other things, I suppose – is undeniably enticing, after all. Even more so with the upcoming geographical addition, Albion, giving players new territory to explore in their unorthodox spaceship/locomotive. That said, Sunless Skies is still very much an unfinished project at the time of writing (hence it being tagged as Early Access on Steam and In Development on GOG.com), currently scheduled for a September 2018 release. In fact, before I forget, here’s a link to Failbetter Games’ roadmap, for those curious as to what’s planned and what’s already implemented. Ah, if only more developers were so keen on keeping everyone in the loop after putting their next yet-to-be-finished title up for purchase. If only. Your captain’s actions could tip the precarious political balance of a region. Will you run guns for the Independents? Or spies for the Empire? Choose wisely – your decisions will affect the story; not just for yourself, but for your future captains as well. Oh, and getting back to the topic at hand: from April 4, Albion! A brand new region full of… dirty secrets, apparently, taking place in Victorian London. In space. Ruled by Queen Victoria (surprise! ), who has somehow acquired the means by which to manipulate time, ever so slightly. What a strange – and rather lovely – alternate reality, this one. That’s unfortunately also just about all the details shared for now, but eh, at least Albion is only a couple of weeks away! Are you ready to set sail and venture into this strange, potentially hazardous version of the British Empire? Sunless Skies [Early Access/In Development] is available on Steam and GOG.com, carrying a $24.99 price tag.